First you should take care of the blackberry and sugar mixture because it needs to sit for a while. Stir together just the berries and sugar in a large bowl and let it sit out for 25 to 30 minutes. This will coax out the juices of the blackberries so that they can be sweetened up by the sugar, and we can taste the full spectrum of the fruit–this process is called macerating. After about 20 minutes, you should turn on the oven to about 375ºF and start preparing your batter. Pick out a clean baking dish, a smaller one will do, like a 9x9-inch pan, pour in the batter and smooth it out. You can choose to line it with parchment paper or not, but don’t grease the pan (there is enough butter in there already!). Finally, pour the macerated blackberries on top with all the sugar included and evenly distribute it over the batter. Bake this promising pan of happiness in the oven for 45 minutes to an hour, depending on how golden you prefer it to be. Let it set up for a good 15 minutes so it will hold its shape. It will be bubbling like crazy and quite hot, so be careful! 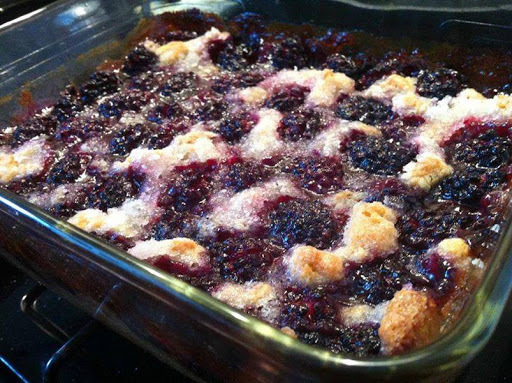 This hour goes a little like this: you can hear it bubbling through the vent behind the stove, you can smell the buttery dough caramelizing with the sugar, and you can see the dotted crown of blackberries creating that quintessential golden cobbler crust. It is a marvel to have in your oven, let me tell you!